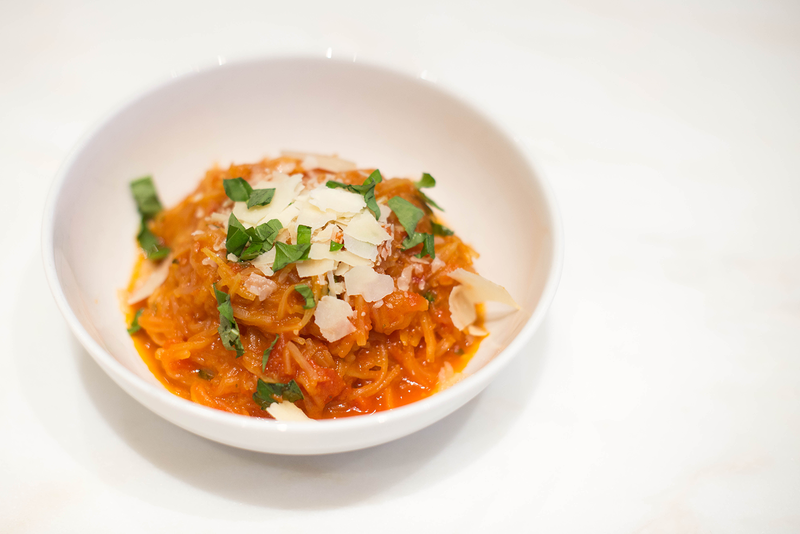 Very similar to the Cauliflower “Pasta”, this is an easy, healthy recipe often. It’s another great pasta replacement, both as a side dish or a main. Sometimes I like to top it with a few turkey meatballs to add some protein! Enjoy, and I hope you’ll check out the rest of my recipes here! Heat oven to 450. 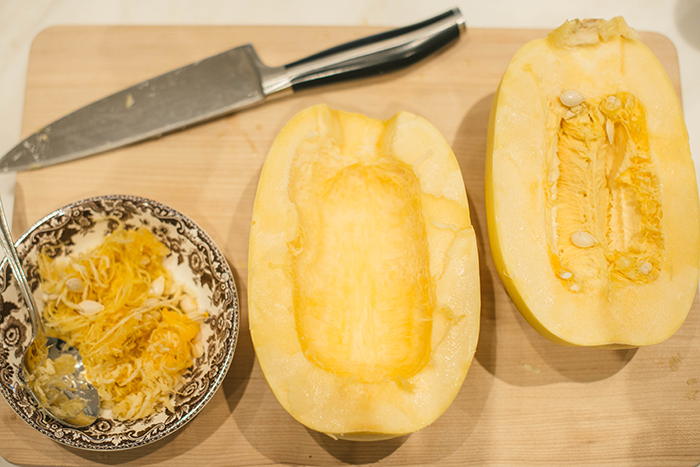 Place spaghetti squash on cutting board and slice longways with a large knife. 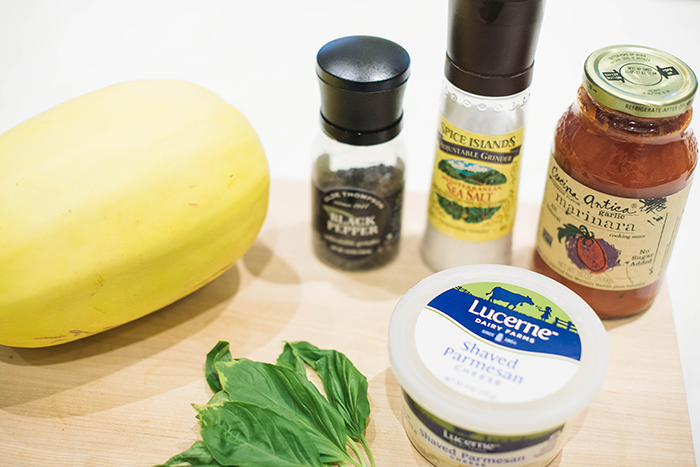 At this point the spaghetti squash is rock-hard, so it can sometimes be a little difficult – be careful! Once separated, grab a spoon and scoop out all seeds until you’re left with clean, solid flesh. 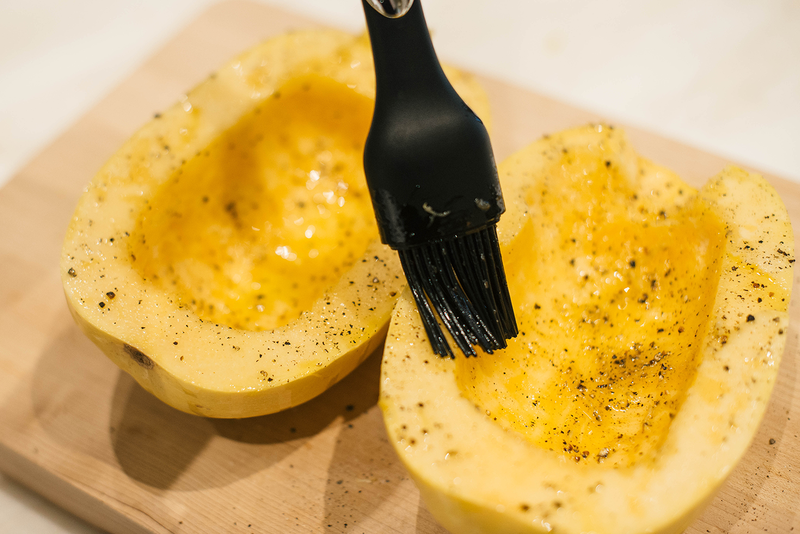 Pour a little olive oil into the center of each squash half, and use a basting brush to coat each fully with oil. Next, sprinkle an ample amount of salt and pepper on each half. Once the oven is heated up, place each spaghetti squash half flesh-down onto a non-stick cookie sheet. Roast for 30-40 minutes or until the outside skin is soft (touch with a fork or other utensil – not your hand!). 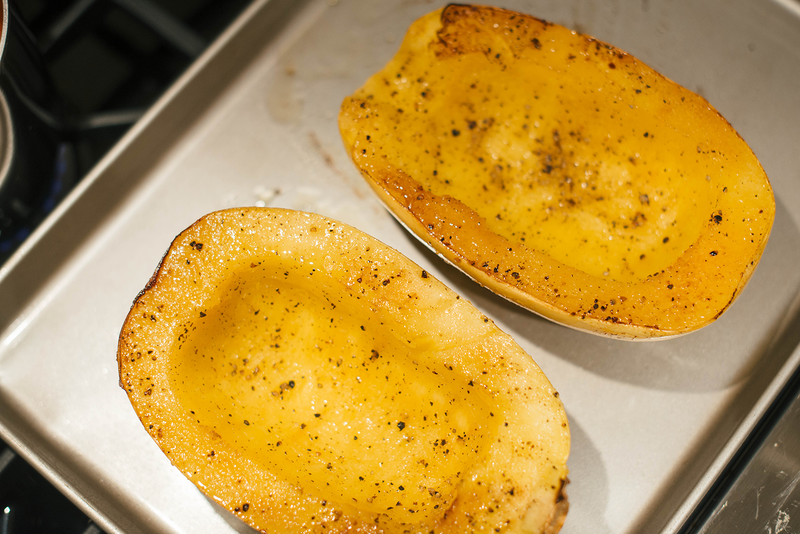 Once squash is fully cooked, remove from the oven and let cool for a few minutes. While the squash is cooling, heat up your marinara in a large saucepan. 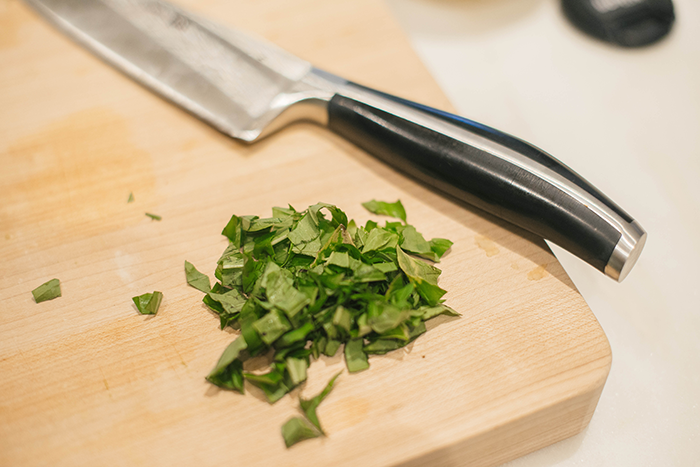 Add half of your chopped up basil to the marinara for a little extra flavor. Now that the marinara is heated up and the squash has had a chance to sit for a few minutes, flip over each spaghetti squash half. Grab a large spoon or fork and drag across the flesh of the squash – at this point the flesh should take the appearance of spaghetti. Scoop out the flesh and place it into the marinara saucepan. 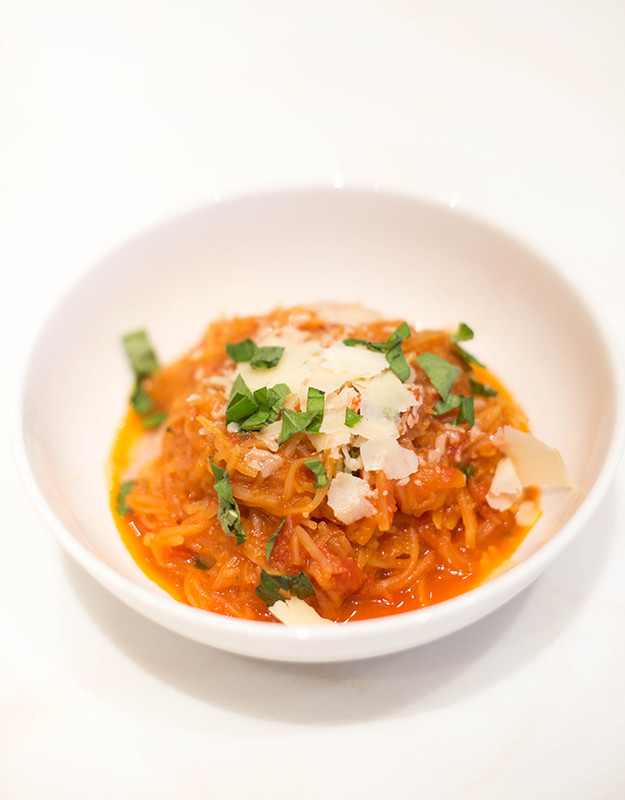 Stir in all of the spaghetti squash until it is fully coated in marinara. Carefully transfer spaghetti squash onto two plates. Sprinkle with parmesan and the last bit of basil and serve! My latest obsession is stuffed spaghetti squash – essentially follow the same steps that you did, then fluff up the insides of the squash with a fork, then fill it with stuff, top with a bit of cheese & pop back into the oven. I have made a taco version of this (so filling would be ground chicken, salsa, peppers & onions) as well as a chicken pesto one and a buffalo chicken one! They are all SO yummy and possibilities are endless. Also, just a tip – it’s way easier if you microwave the squash for 5 minutes to soften it before cutting it in half! Be careful though, it will be hot! But easier than cutting a rock hard squash! Yes, so delish & guilt free. The way you prepared it looks fabulous, and I’m always on the lookout for more healthy ideas. But your version looks amazing too!